The new state-of-the-art lobby at the Courtyard by Marriott Milwaukee Airport provides greater flexibility and choices for our guests. At the center of it all is The Bistro, your destination for a great Starbucks beverage, breakfast, or drinks and dinner during the evening. You'll also enjoy inviting, flexible spaces where you can work or relax, free Wi-Fi throughout and easy access to the latest news, weather and airport conditions via our GoBoard technology. Plus, our well-equipped fitness center, indoor pool and whirlpool will help you stay refreshed and energized. The Courtyard by Marriott Milwaukee Airport is centrally located to the Harley Davidson museum, Miller Park, Summerfest Grounds, and the Milwaukee Art Museum. We are also near many corporate offices including Caterpillar, Rockwell Automation, Johnson Controls, Krones and many others. 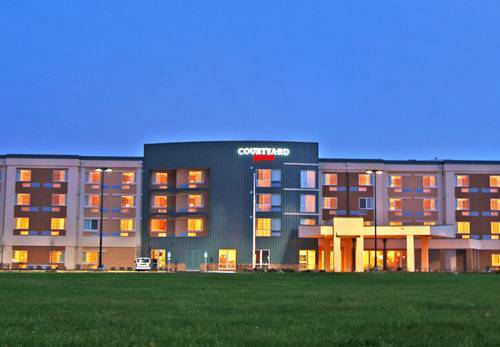 Whether traveling for business or pleasure, your stay at the Courtyard by Marriott Milwaukee Airport is sure to exceed all of your expectations! The Bistro - Eat. Drink. Connect. : Your food and beverage destination for refreshing breakfast choices in the morning, and a variety of dinner, beer and wine options in the evening. The Bistro also offers specialty beverages made with Starbucks coffee to help you get a jump on the day.